This Fabulously Functional Work-Friendly Bag Is on Sale! It’s time to open the old bag of tricks. What’s inside? A new bag! Sound the alarms! Alarm clocks, that is, because this new find is going to be the ultimate help in getting Us started with our workday. We love bags of all styles, but a clutch isn’t necessarily the best choice for a commuter. That’s why we’ve picked out an HBIC (Head Bag In Charge) that’s sure to make Us the HBIC (Head Babes In Charge) at work. You know what, sound the alarms again, because it’s also on sale! Meet the Kate Spade New York Jackson Street – Small Rubie Leather Cross-Body Bag, one of our absolute favorite choices for commuters like us looking for a no-fuss everyday bag that still wows. The smooth pebbled leather looks lavishly polished and the clean lines demonstrate the endless appeal of simplicity and minimalism. See It: Get the Kate Spade New York Jackson Street – Small Rubie Leather Cross-Body Bag (originally $278) for $186 now at Nordstrom! Let’s get into the nitty-gritty. Actually, that sounds a bit rough for this posh bag. Let’s get into the nitty-pretty instead. 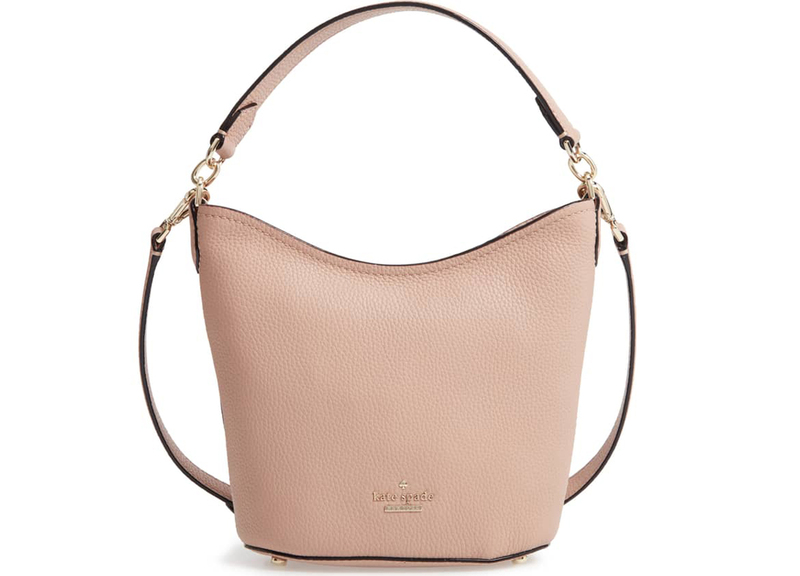 Apart from the sleek leather, this Kate Spade bag has much more to offer. With no extra outer pockets, commuters on the go won’t have to worry about their belongings falling out while they’re running to make a 9 a.m. meeting. But that doesn’t mean there’s no storage space! Unzip the top by pulling on the convenient and cute leather tassel attached to the zipper to find an interior wall pocket, which is irreplaceable when we need to keep a few items separate for easy fetching throughout the day. Not to be forgotten or overlooked, the inside of the bag also features the signature bookstripe lining we love to love. Another understated feature we appreciate is back on the outside of the Jackson Street bag. No, not on the top or side, but the bottom! At each bottom corner is a tiny gold foot that will protect the bag’s leather in case we need to put it down for a hot second to pull out our train ticket or take a bite of our morning protein bar (which may or may not just be a chocolate bar). These petite, protective feet go with the gold hardware of the zipper and clasps, as well as the iconic Kate Spade New York logo gracing the front of the bag. What else do we love? Yes, there’s more! Let’s discuss the straps. There are two, which means double the functionality. We can either wear this bag as a cross-body if we’re in for a longer trek and want to keep it close to us, or we can ditch the longer, 24-inch strap and stick with the shorter one. We love that the short one is there in case we need to grab the bag and go as quickly as possible, whether it’s to own a presentation or to hurry off to lunch. We also adore the look of holding our bag on our forearm. Something about it just says “fancy,” right? This bag comes in two perfectly neutral shades: Black and Ginger Tea. And yes, both shades are included in this can’t-miss sale! Black is a pure black that has an illustrious shine when angled toward the light. The inside lining is a can’t-go-wrong biscuit color, which is a slightly darker version of the Ginger Tea shade of the bag. Can we just say how cute and fitting the name Ginger Tea is? It reminds Us of the morning tea we make as soon as we get to work. With a lovely touch of cream and the sweetness of sugar, our tea is going to perfectly coordinate with our Ginger Tea bag! How cute is that? To offset this gorgeous shade, the inside lining dips down into delicate darkness. It’s a deep, vampy red that has our hearts beating out of our chests. Because both shades are neutrals, we can pair them with anything we want. A fitted blazer, a colorful sundress, or perhaps a simple, collared button-down French-tucked into patterned pants. No matter what our dress code or personal style, this bag fits right in. Kate Spade New York has “perfected the art of playful sophistication” yet again with the Jackson Street bag. We’re always looking for work-to-play wardrobe and accessory staples, and we’ve just added this bag to the list of musts. With the sale price plus the free shipping, how could we not have a winner? 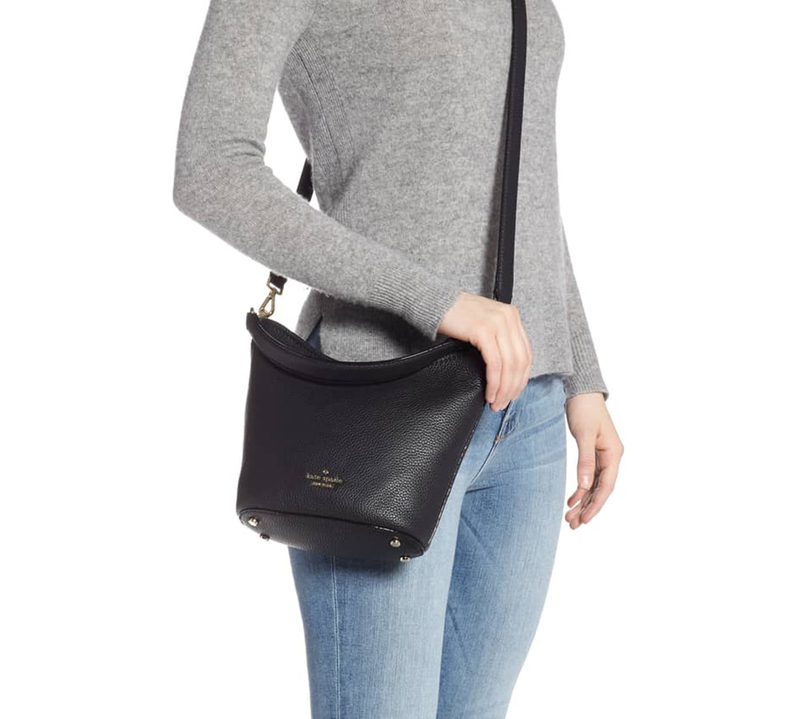 See It: Get the Kate Spade New York Jackson Street – Small Rubie Leather Cross-Body Bag (originally $278) for $186 now at Nordstrom! Not your style? Check out more Kate Spade favorites here!